As of Legion, this post is completely out of date. 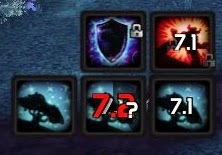 If you've stumbled upon this post looking for Enhancement Weakauras, allow me to redirect you to Wordup's Weakaura setup. I personally use a stripped and modified version of his string. Back in March I had put together a little post of the WeakAuras I had been playing around with. Since then I've come across several incredibly useful auras that other players have put together, customizing them to my taste in certain cases, and I've even made a few shaman-specific auras myself. The image above show all of the auras I'm currently using. Looks a little noisy, but keep in mind most of these will not be displayed at the same time. 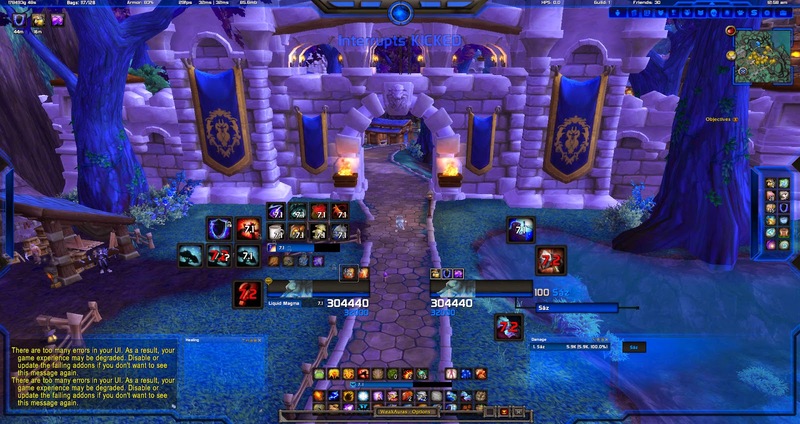 I've divided these auras into four sections: Defensive and Healing, DPS, Procs, and Interrupts. These auras come in the Defensive and Healing pack. Upper Left - Glyph of Lightning Shield is activated, applying the 10% damage reduction. Upper Right - Shamanistic Rage is active, displays remaining duration. Bottom Row - Spec dependent. Shown is Nature's Guardian activation, duration, and cooldown. The "?" will display the shield value of Stone Bulwark Totem, SBT's duration will be an icon placed under where Shamanistic Rage is shown. Astral Shift will likewise appear underneath Shamanistic Rage's aura. 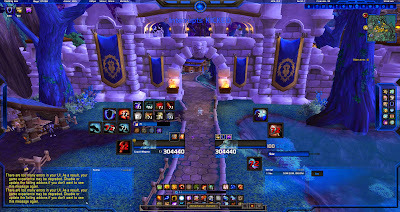 Here we have miscellaneous auras split between the Defensive and Healing pack and the DPS pack. 1 - Fire Totem tracker (DPS). Will display an image of either your Fire Elemental, Searing Totem, or Magma Totem (depending on which you're using at the time) when you have 10 seconds remaining on the totem's duration. Incredibly useful for when you're specced into Liquid Magma. 2 - Elemental Mastery duration (DPS). Pretty self explanatory. Will only be displayed while the talent is actively being used. 3 - Elemental Fusion tracker (DPS). Will display one icon for one stack of EF, two icons for two stacks of EF. Very necessary for getting the most out of that talent. 4 - Ancestral Guidance tracker (D&H). Will display anytime any shaman in the raid activates AG. Also displays remaining duration of the current AG being used. 5 - Unleashed Flame tracker (DPS). Displays if you have an unused Unleashed Flame buff. 6 - Feral Spirits tracker (DPS). Only displays while wolves/raptors are active and displays remaining duration. 7 - Liquid Magma tracker (DPS) - Displays when LM is activated and displays remaining duration. 8 - Healing Rain duration (D&H) - Displays the remaining duration on your current Healing Rain. Timer is accurate when using the talent Conductivity, though the visual bar may be a little funny at times. In this image we see a bunch of trinket, ring, and weapon procs, along with a duration timer for your potion. This series of auras (aka the Procs pack) is from a much larger pack someone else put together, which you can find here. Since I'm still using it, I've also included an aura for Scales of Doom. The larger pack includes ALL trinkets from Blackrock Foundry, as well as all weapon enchant procs. Ring procs may also be found within, though I've included both versions in the smaller pack as well. Last up we have the interrupt aura. Stumbled upon this little gem in one of the WoW subreddits and found it somewhat useful, especially if not all of your interrupters run with some sort of announcing addon. The word 'Interrupts' will be replaced by the name of anyone who successfully interrupts a spell, bosses included. I've brought down the opacity of this aura just because of personal preferences. I'm still very much getting used to WeakAuras, both in utilizing them visually in a raid setting and on the creation side of things. If anything seems off/doesn't work quite right, please drop me a line so I can go about fixing it!